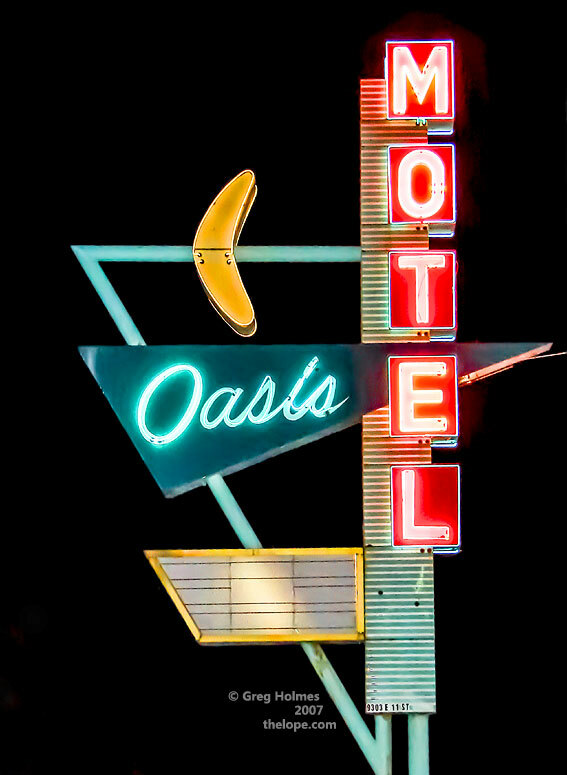 One of the best googie motel signs on Route 66 belongs to the Oasis Motel at 9303 East 11th in Tulsa, Oklahoma. This was November of 2007. The sign is still there, with the addition of a Route 66 shield graphic beside the message board, which now holds text declaring the motel to have the best rates in town. A few years beforehand the sign had a small, asterisk-like starburst atop it but it was gone by the time I shot this. Also, you can see a fragment at right of neon tubing that used to surround the triangle. How old is the sign? I don't know; I can't even get the place to answer the phone. My guess would be late 1950s to mid-1960s. Some locals call this the banana motel because of the yellow neon boomerang. This was shot with my old Sony DSC H2 point and shoot with fill flash; I was dissatisfied with the shot at the time due to noise at its max ISO of 400. A few days ago I ran across the file and used noise reduction.